Houston’s most intimate theatrical experience. Want to give the gift of magic? Wander into the beautiful Brown Gallery, cocktail in hand, and witness an unbelievable 90-minute performance mere inches from your seat. In this one-of-a-kind production, flashy props and leather pants have been replaced by Ben’s quick wit and internationally acclaimed dexterity. You’ll see unexplainable sleight-of-hand magic, feats of the mind, and dazzling piano playing. Seating is limited. LISTEN to NPR's 88.7FM Houston Matters' coverage of Magic, Music, & Mayhem. Who is the man behind Magic, Music, & Mayhem? DOWNLOAD Houston Chronicle's exclusive interview with Ben Jackson to find out! LISTEN to Ben's interview with "The Weekly Brew - The Voice of Houston" (interview begins at 15:53). LISTEN to Ben chat with the HMNS staff about the Mysterious History of Magic. 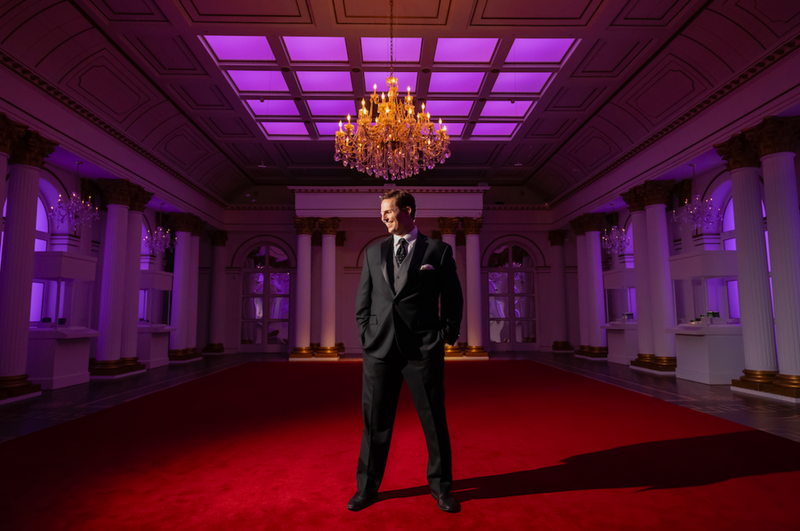 WATCH Ben Jackson perform live on Houston's KPRC channel 2 in the famous Grand Salon at La Colombe d'Or Hotel. Q: Is this a show for kids? A: No. The age minimum for this show is 12 years old. Although there is no profanity or crude humor in the show, the environment and content are catered to adults. A: Yes. The dress code is cocktail attire. In order to maintain the proper atmosphere, please do not arrive in apparel such as torn jeans, sneakers, t-shirts, tank tops or baseball caps. A: All ticket purchasers must check in as soon as they arrive in the lobby of the museum. Look for the lady in black; she will check you in. General Admission seats are assigned on a first come, first serve basis. First Row Reserved seats are found on the first row and are reserved by party name. All patrons will enter the gallery at the same time. Q: Are video and photography allowed during the performance? A: No. During the performance, video and photography are strictly prohibited. We encourage patrons to take and share photos of their experience after the performance. Q: Where is the performance held inside the museum? A: The show will be held in The Brown Gallery on the first floor of the museum. If you park in the parking garage, take the elevator to the first floor. Exit the elevators, turn left, and then turn right towards the museum gift shop. Make your way through the gift shop and into the museum’s lobby. Once in the lobby, turn right and walk straight until you see glass doors to your right, directly across the lobby from the entrance to the planetarium. Here you will find a member of our staff to direct you to the waiting area for the Brown Gallery. A: We suggest arriving 25-30 minutes before your scheduled showtime. A: Complimentary parking is available in the HMNS parking garage. Limited street parking is also available. Q: When does the show begin? A: The 7:00pm performance begins promptly at 7:00pm. To give our staff time to turn the room, the 9:00pm performance begins closer to 9:15pm. A: The performance runs 90 minutes and there is no intermission. Q: Do I need to print out and bring my tickets? A: No. Printed tickets are not necessary. An usher will check you in using the ticket purchaser's name. Q: May I purchase drinks? If so, where? A: Yes. There is a cash bar located just outside of the Brown Gallery. Q: Is food allowed inside the Brown Gallery? A: No. But beverages from the bar are allowed and encouraged. Q: Is there any "blue" material or profanity in the show? A: No. Ben does not employ suggestive or “blue” material in the performance. Additionally, he will not use profanity. This is a "clean act" from beginning to end. A: All ticket sales are final. If you have additional questions or comments concerning Magic, Music, & Mayhem, contact us here.